A multi-collaborative digital skills development programme started this week (created at Plymouth University). 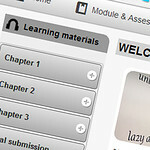 It is aimed at those involved in teaching wishing to learn about new and different digital tools first hand. Further details can be found on the DigiThings blog, which is worth a look. For this course I had the pleasure of compiling together ~30sec talking heads introduction videos from each of the team members involved, within their respective areas. The above Prezi features all the videos. Many thanks to all and also to Flea Palmer, Edd Bolton and Ed Bremner for the video brainstorming and Prezi development. Those interested in the video equipment - I used a Canon 650D and edited the content within Premiere Pro CS5.5 (also for titling). Screen capture was performed by the respective team members (using applications such as Adobe Captivate, ScreenFlow and Camtasia).